Even the most responsible and experienced drivers can get into accidents, as a Liberty County Sheriff’s deputy learned when he was rear ended by a local corrections officer recently in Dayton. Corporal James Ott’s patrol car was stopped in morning traffic waiting on a light when an officer with the Texas Department of Corrections collided with his vehicle. The officer was on her way home from work and fell asleep at the wheel. Investigators determined she did not have a valid driver’s license and charged her for that and failure to control her speed. Neither she nor her passenger was injured, but Corporal Ott suffered neck injuries and went to the hospital. Both vehicles incurred minor damage. When you’re injured in a car accident through no fault of your own, whether on the job or off, you need personalized, committed legal representation. If you’re injured on the job, you may be eligible for a workers’ compensation claim. Our attorneys are experienced, skilled and compassionate, ready to listen to your story and answer any questions you have. We bring the specialized expertise to support you through workers’ comp claims as well as advocating for your interests with any insurance company involved in the case. 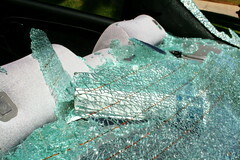 The after-effects of even a minor traffic accident can be difficult and long term. Neck injuries in particular can have enduring consequences, especially for people who need to be physically ship-shape for their jobs. An attorney can make the difference in getting the situation resolved in a way that benefits you. Avoid an ongoing struggle with the after-effects of something beyond your control. We are here to talk to you 24 hours a day, 7 days a week for a free consultation, and our services are no charge to you unless you receive a settlement. Don’t face an accident alone – call or email us today.